I'll drink no wine before its time. Here are 10 wines (all wonderful) that are affordable and will fit in at any gathering. Best of all, they're readily available. 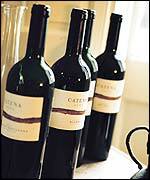 Where possible, I've provided ratings from Wine Spectator, Wine Enthusiast or California Grapevine magazine. Points are given out of a possible 100. I've listed prices at various retail locations in Palm Beach county, but bottles can vary by several dollars at different places. Call around to find the best price. To print out this list, highlight the text and click on FILE, PRINT, SELECTION, OK.
For a great e-book called Outstanding Wines Under $15 (PDF format), right-click on the link below and choose Save Target As. Continue reading below. . .
1. 2001 Muscadet de Serve et Maine by Sauvignon and Fils: This French White is filled with lemon and apple flavors. It's a nice appetizer wine and also goes well with seafood. 87 points; Wine Spectator. $8.50. 2. 2001 Riesling by Covey Run (Washington State) -Well-balanced with sweetness and acidity, this medium-bodied wine has aromas of peaches, nectarines and honeysuckle. It would pair well with a spicy appetizer or mild cheeses, or even Thai cuisine. $6.50. 3. 2000 Sauvignon Blanc by Callaway -This California white is crisp, clean, and medium to full-bodied. Well- balanced with citrus and melon flavors, it has a clean finish and elegant aftertaste Would work well with cheese appetizers or with a salad course. 90 points; California Grapevine. $6.99. 5. 2001 Rose by Vega Sindoa (Spain) -A blend of Cabernet and Garnasha grapes, this medium-bodied wine is a light salmon color with cherry-like fruit. This rose works well with a salad course (use fruit vinaigrette dressing) and barbecued chicken, pork or beef 88 points; Wine Enthusiast. $6.99. 6. 2001 Shiraz-Cabernet by Rosemount (South Eastern Australia) - With flavors of blackberry, cherry and aniseed, this wine has a nice polished finish. Hearty cheeses like blue or sharp cheddar would go well with this. For a main course, it would work nicely with beef, duck or lamb. 86 points; Wine Spectator. $9. 7. 2000 Gotim Bru by Castel Remel (Spain) -This full-bodied wine is sweet and rich in texture. It has a wonderful balance of black currants, licorice with a nose of cedar and earthiness. Very versatile, this is a nice sipping wine but would also go well with beef or pork dishes. 92 points; Wine Enthusiast. $9.99. 8. 2000 Merlot by Bogle (California) - Plums and cherries with compliments of spicy oak balance this merlot. This will go well with pastas that have light tomato sauces or hearty meat dishes. 86 points; Wine Spectator. $9. 9. 2000 Pinot Noir by Meridian (Santa Barbara)- The black cherry, vanilla and pepper blend together to balance this soft and supple wine, but still give it a spicy finish. If would pair nicely with grilled lamb or pork. $8.50. 10. 2000 Red Bull Zinfandel by Rancho Zabaco (California): Dark plum in color, this medium to full-bodied zinfandel has aromas of black fruits, pepper and spice - and a long, lush finish. Great with Italian, Southwestern or barbecue foods. $7.50.